A worthy and versatile addition to the MPC range. For those who like everything in one box, the 5000 is hard to beat. Record up to eight audio tracks. Superb workflow. Large screen for detailed editing/navigation. Deep sample editing. New workhorse synth. No 24-bit/96kHz support. CD/DVD burner is an optional extra. The 5000 looks like an MPC, and feels like one too. Up to eight tracks of live audio can be recorded in. The screen is Akai's best ever. 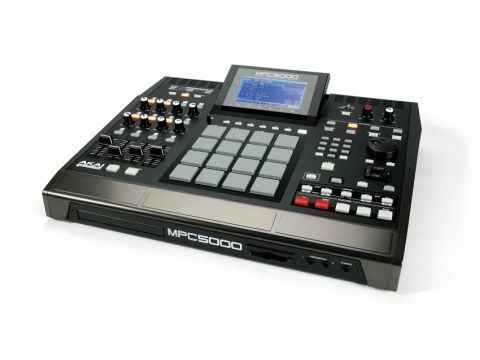 The MPC 4000 is widely regarded as the most fully-featured MPC ever. However, this has now been discontinued and replaced with the MPC 5000. There's no mistaking that this is an MPC through and through and, we think, the best looking yet. It's well laid out, though its footprint is large, so don't expect to be taking this box onto a train or plane. Also, it can't be run on batteries. The front panel is a tale of two worlds. The first is the legacy left by Roger Linn and the original Akai company - a note repeat button, transport controls, data wheel and most importantly, the 16 velocity-sensitive square pads which are the key to inputting note data (unless you are inputting notes via a MIDI Keyboard) and now also double as mode changing buttons, which help speed up the workflow. The second world is Numark's, the company that has owned Akai Pro since 2004. The screen, which is very similar to the MPC 4000's, is much larger, easier-on-the-eye and facilitates grid/sample waveform editing. Overall, this MPC is much easier to program than its smaller screened siblings. There are more Q-link controls than on the 2500 and 4000 and these can be assigned to a huge range of internal parameters and to control other MIDI equipment. Potentially, the 5000 is a great controller for all MIDI gear and can work as a great live interface for controlling plug-ins or DAW software. The general workflow is superb, which is mainly thanks to the intuitive panel layout and screen. It's great having the pads in the middle and the Q-link controls to the left - you can hit the pads and tweak parameters in real time with your left hand. Anyone who's familiar with the older MPCs will feel at home instantly and new users will be flying around in no time. Our only beef with the external design is the plasticky feel of the armrest and side panels. The rubberised soft armrest on the MPC 3000 still reigns supreme! Internally, this MPC works in a similar way to older models but the software has been expanded. It comes with just 64MB of sample memory - this can be expanded to 192MB - and there's also the option to install a CD-R/ DVD drive (this should really be included at this price). The beat-making process is essentially the same as on other MPCs, but beats can now be layered with synth sounds or audio. Simult mode enables four pads to be triggered by one pad, while internal resampling with effects is also possible and samples can be loaded/saved to the memory card or hard disk. You can also connect the MPC to your DAW via USB and drag samples forward/back between the DAW and the MPC. This is one major productivity advantage over the older MPCs. Sample editing is comprehensive. Chop Shop v2.0 enables ReCycle!-style sample treatment, automatically giving you the option to sample into slices and assign the samples to the pads, while creating a new program. Single hits or phrases can be chopped from a continuous WAV file, organised and manipulated into a new beat. Samples can also be pitch-shifted and timestretched using 18 special algorithms. Audio is outputted via 10 balanced jack outs, ADAT (eight channels) or S/PDIF. There's a fully-featured sequencer in the MPC 5000. A sequence can contain any type of MIDI event (synth/drum/MIDI) and edited in fine detail in step edit mode or via the piano roll/DAW-like grid editor. This is fine, though a mouse input/VGA output (as you'll find on the Roland MV-8800) would have made it even better. Each sequence can have up to 64 tracks, and sequences can be easily chained together in song mode to create an arrangement. Whole tracks can now be assigned/triggered or muted by one or more pads (groups) in the track mute screen, which is amazing for live use. You'll be glad to hear the much-debated swing-quantise function is still fully intact, and now comes with added strength and triplet parameters. The sequencer feels tight and accurate, though in direct comparison, our beloved MPC 3000 still has the edge both in terms of sonic punch and feel/ swing. A useful new feature called Continuous Sample Tracks ensures that long samples start from the correct point in their cycle each time play is pressed, so no more waiting for the measure to come back round before the sample re-triggers. A significant downside with the 5000 is that its sample rate is fixed at 16-bit/44.1kHz. Most people now work at 24-bit in their DAWs and the extra digital headroom would definitely have been welcome. It's strange that Akai has chosen a 16-bit upper limit, especially when you consider that the MPC 4000 was fully 24-bit/96kHz capable. The MPC 5000 allows eight tracks of live audio to be recorded/streamed from/to its hard drive and these can be added to a song and edited (but not with quite the ease DAW users are used to). Recording time is only limited by the size of the internal 80GB hard drive - unfortunately, you can't currently record or stream to/ from an external USB hard drive which is a big missed opportunity. Audio can be edited, automated and panned in the track mixer and mixed down with effects/mastering. This means that complete songs - with beats, synths, effects and audio - can be finished and mixed within the MPC and burned to CD/DVD (if you have a drive installed). The MPC 5000 sounds great for drums in particular and is clear, wide and punchy. However, the synth can sound slightly harsh/grainy in the mid/hi-mid range at times, (though the effects/EQ/compression can temper this and are very useful additions). However, we did notice some aliasing on the tails of certain delays and also stepping/ quantisation while using the filter. This is disappointing, though the synth certainly adds to the MPC's viability as one-stop production centre. While it's lacking some features from Akai's last flagship MPC, the 5000 strikes a good balance in terms of sounds, looks and features. It's great to have all the extra real-time control, hard disk recording, a synth/arpeggiator, effects, a fast USB 2.0 connection and sequence grid/sample waveform editing on a larger screen. At this price, though, we really think that the MPC 5000 should have a 24-bit sample engine, a DVD/CD-R burner as standard, and more polyphony and RAM. Also, the keygroup function on the 4000 that enabled multi-sampled instruments to be imported appears to have been lost, which is a real shame. It's almost as if Akai is giving up some of the 'high end' features in favour of more, raw sound-producing options. So, while this box is more than worthy of wearing the MPC badge, the loss of 24-bit support alone means that most dedicated MPC 4000 users will be hanging on to theirs for dear life - at least until a similarly high-definition MPC 6000 arrives. As good as the 5000's new features are, in terms of digital recording this feels more like an MPC 3500 than a new flagship.